Rock mass in the field consists of various discontinuities in the form of joints, bedding planes, faults, etc. Presence of these discontinuities makes the mass anisotropic in nature, and hence its engineering properties are direction dependent. The properties which affected most are strength and modulus. Therefore, before construction, it is mandatory to assess the strength and the modulus in each direction. However, to quantify anisotropic nature, a dimensionless parameter anisotropic ratio is used. It is defined as the ratio of maximum to minimum strength or modulus considering all the possible directions. Lesser anisotropic ratios indicate the less anisotropy in jointed rocks. If strength and modulus of rock are altered due to some reasons like installation of reinforcement, the anisotropic behaviour will also change. To assess the effect of reinforcement on the anisotropic behaviour of rock, an experimental study was performed in which passive bolts were used. Three different types of synthetic jointed rock specimens having different strength and modulus were prepared. The size of the each specimen of jointed rock was 150 mm × 150 mm × 300 mm (height). Each specimen has one smooth joint orientated between 0° and 90° with respect to the horizontal axis at an interval of 15°. Two fully grouted passive bolts of 6 mm diameter were installed at the centre of the jointed rocks. All the specimens were tested under uniaxial condition. The results indicated that the passive bolts enhanced the modulus and strength of jointed rocks and subsequently reduce the anisotropic behaviour. Rock mass consists of discontinuities like joints, bedding planes, faults, etc. These discontinuities are located at different orientations, and hence the mass exhibited the anisotropic nature. Due to anisotropic nature, the engineering properties, particularly strength and modulus, are different at each orientation/direction. The extent of anisotropy in rock mass depends upon the numbers of joints set present in the mass, characteristics of joints and physical/engineering properties of the intact material. Each factor plays an individual and important role in governing the engineering properties of mass. The anisotropic nature significantly affected the construction of structures through rock mass. Due to anisotropy, sometimes it is very difficult to find out the most favourable conditions for construction. Equipment and techniques required for construction are also affected by the anisotropy of mass. To represent anisotropy in the quantitative form, a term ‘anisotropic ratio’ is used. It is defined as the ratio of maximum to minimum strength or modulus by considering all possible directions . A higher value of anisotropic ratio indicates the higher anisotropic in mass, i.e. there is a large difference in the value of strength and modulus in particular orientations. Lower values of anisotropic ratios represent the lesser isotropy in mass ideally reaching towards ‘isotropic condition’. 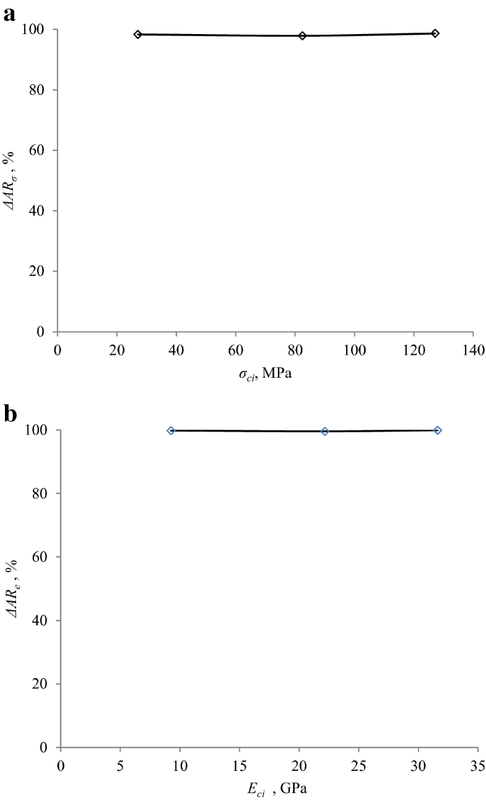 However, no definite ranges of anisotropic ratios can be defined for a particular type of mass. The previous studies [2, 3, 4, 5, 6] suggested that the rock bolts affect the engineering behaviour of rock masses. Due to bolts, the strength and modulus also altered . Hence, it is realized that the use of bolts in mass can reduce the anisotropy of rock mass up to some extent. In the present paper, the effect of passive bolts on the anisotropic behaviour of jointed rock is investigated through experimental studies. To examine the effect of rock bolts on the anisotropic behaviour of jointed rocks, an experimental study was planned. The plan of experimental work is presented in Fig. 1. Concrete was adopted as model material to simulate the rock. To cover a wide area of modulus and strength, three different grades of concrete, T1, T2 and T3, were cast. The constituents of these concrete and their respective ratios are listed in Table 1. All the tests necessary for characterization were performed on these synthetic rocks. The properties of the synthetic rocks are listed in Table 2. 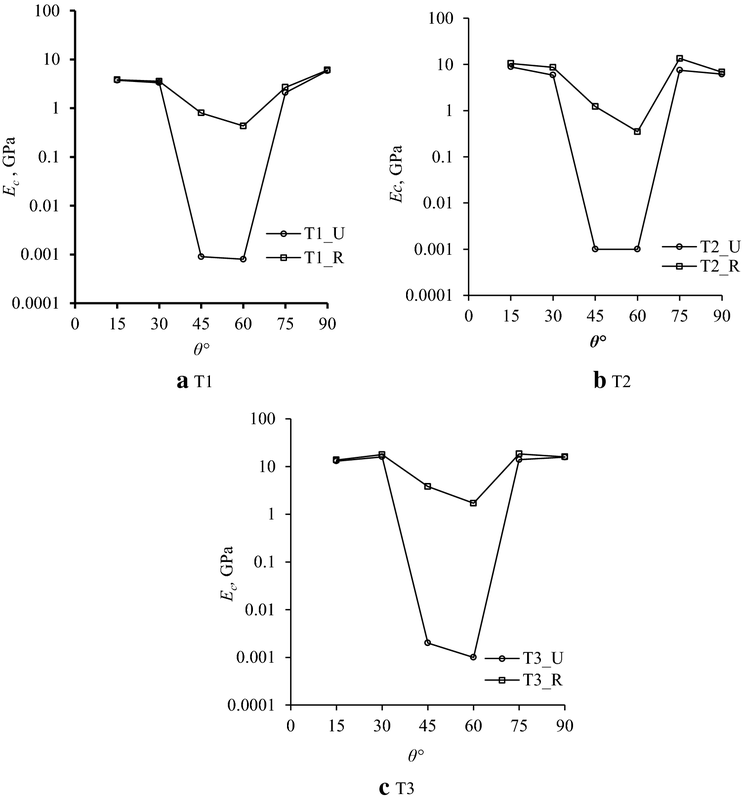 The uniaxial compressive strength of the intact material (performed on cylindrical NX size specimens) of T1, T2 and T3 is 27.09 MPa, 82.44 MPa and 127.13 MPa, respectively. The respective moduli are 9.26 GPa, 22.16 GPa and 31.61 GPa. On the Deere–Millar classification chart, T1 was classified as EM (low strength and medium modulus), T2 was classified as CM (medium strength and medium modulus) and T3 was classified as BM (high strength and medium modulus). The special steel mould was used for casting of jointed rocks. Prepared specimens had a cross section of 150 mm × 150 mm and 300 mm height. Length-to-width (L/B) ratio of specimen is 2. Each specimen consists of one smooth joint which is orientated at θ = 0° to 90° (at an interval of 15°) from the horizontal axis as shown in Fig. 2. Structural steel bar (tensile strength 550 MPa) of 6 mm diameter was used as passive bolt. The bolts were threaded at the ends. Two bolts were installed in the specimen at perpendicular to the loading direction (Fig. 2). The centre-to-centre spacing between bolts was 50 mm. As shown in Fig. 2, the bolt crosses the joint at an angle θ°. The bolts were grouted with 2-mm-thick cement–sand mortar throughout its length. After the setting of grout, the ends of the bolts were tightened by using nut and washers to avoid slip at the ends. Using an axial loading machine, the uniaxial compression tests were conducted on intact, unreinforced and bolt-reinforced specimens of synthetic rocks. For each test, axial load and axial deformation were recorded and results were investigated. Most of the specimens of synthetic rocks were failed in a brittle manner. In the case of unreinforced jointed rocks, at θ = 45° and 60° sliding failure was observed. By installation of bolts, sliding at these orientations was restricted and shearing combined with brittle failure was observed. 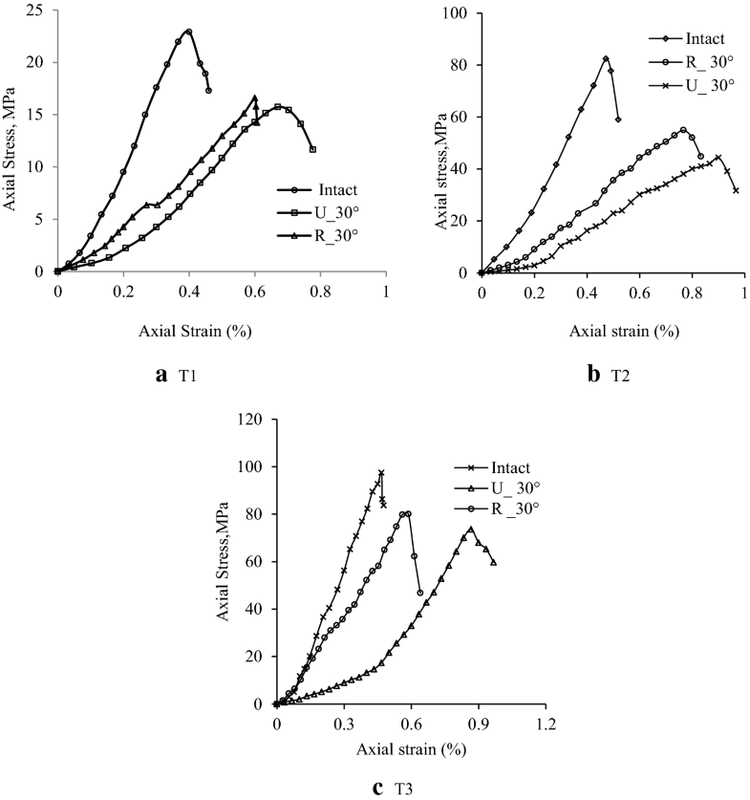 Some plots showing axial stress versus axial strain behaviour are presented in Fig. 3. 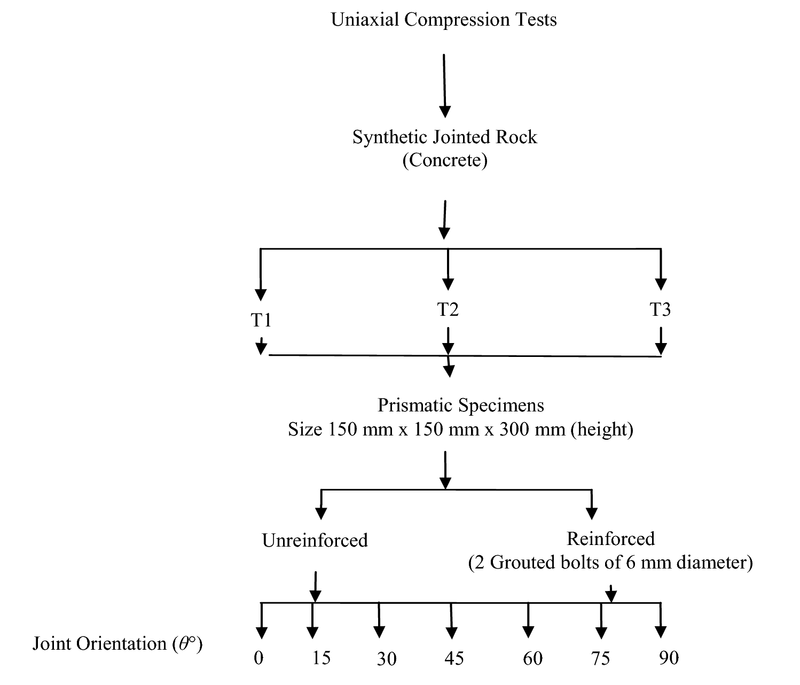 For all three types of synthetic rocks, it is found that the axial stress versus axial strain plot of reinforced jointed rocks lies between plots of intact rock and unreinforced jointed rocks of the same orientation. In the case of reinforced jointed rocks, final peak (or uniaxial compressive strength) is observed at shorter displacement as compared to unreinforced jointed rocks. The presence of bolts makes the unreinforced jointed rock as a single rigid body and restricts the failure along the joint plane. 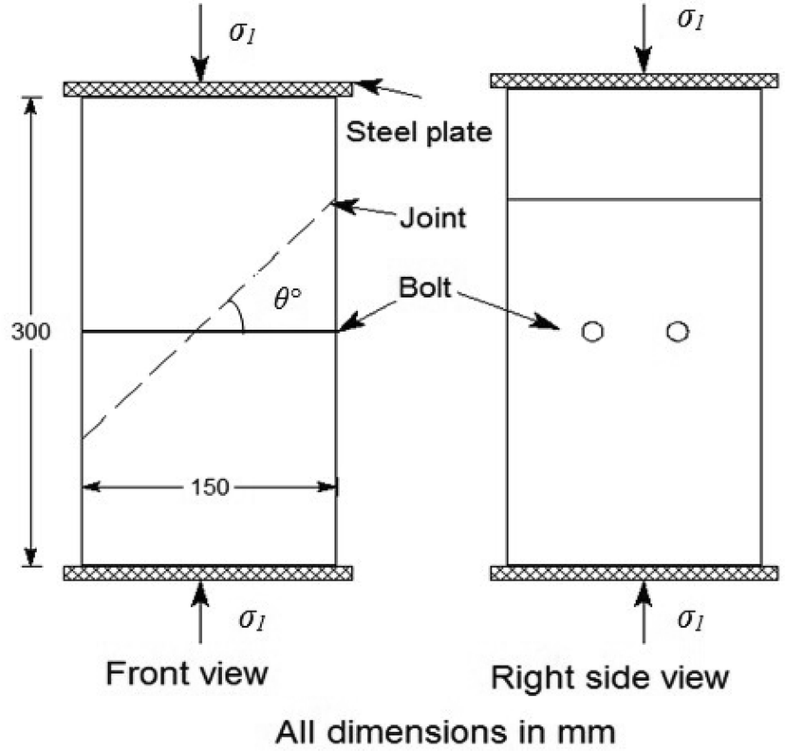 A complex interaction has been generated between the intact material, joint and bolts which modified or improved the engineering performance of unreinforced jointed rocks. The calculated values of uniaxial compressive strength (σc) and modulus (Ec) are presented in Table 3. It is found that the strength/modulus of reinforced jointed rocks is greater than the strength/modulus of the unreinforced jointed rocks at each joint orientation. However, values of strength/modulus of reinforced rocks are less than the corresponding values of intact material. Irrespective of their intact material properties, all synthetic rocks exhibited the same behaviour. A restriction imposed by the bolts on the joint plane enhances the strength/modulus of unreinforced jointed rocks. In other words, it is said that bolts provide a confinement to unreinforced jointed rocks which improve their engineering properties. Figures 4 and 5 show the behaviour of strength/modulus with joint orientation (θ). For both unreinforced and reinforced jointed rocks, similar trends of variation are observed. Also, identical plots of strength/modulus versus joint orientation are found for all the three types of synthetic rocks. Strength/modulus decreases with increase in joint orientation and becomes minimum at θ = 45° and 60°. After this, the strength/modulus increases with joint orientation. These plots show the anisotropic behaviour of unreinforced jointed rocks, i.e. the larger difference in maximum and minimum values of strength/modulus considering all the investigated directions. The curves of reinforced jointed rocks show a flatter nature as compared to unreformed jointed rocks. With passive bolts, modification in the curves of unreinforced jointed rocks is obtained. This indicates that the anisotropic nature of unreinforced jointed rocks is suppressed due to the passive bolts. Passive bolts serve as an integral part of jointed rock and increase its capacity against external forces. Due to the combined action of the intact material, joint and passive bolts, the anisotropy in strength and modulus reduces considerably. This is done by group action, and individual contribution cannot be calculated or isolated. where ARσ and ARe denote the anisotropy in strength and anisotropy in modulus, respectively. AR is a dimensionless factor and can be easily calculated if maximum and minimum values of strength and modulus in the probable direction are known. The lower value of AR represents the less difference in maximum and minimum values of strength or modulus. For all types of unreinforced and reinforced synthetic rocks, the anisotropic ratio (AR) is calculated and presented in Table 4. The values of AR for unreinforced jointed rocks are found to be much higher and vary with uniaxial strength and modulus of intact material. This indicates that the behaviour of unreinforced jointed rocks is highly anisotropic and depends upon the properties of intact material. In unreinforced cases, the anisotropic ratio for strength (AR)σu and modulus (AR)eu is found to be maximum for the T3 type of synthetic rock, while in the case of T1 type of synthetic rock it is minimum. For reinforced jointed rocks, maximum anisotropic ratio for strength (AR)σr and modulus (AR)er is observed for T2 type of rock. In the present investigation, as the strength/modulus of intact material increases, the anisotropic ratio of unreinforced jointed rock also increases. However, this trend is not valid for reinforced rocks and there is a large decrement in values of anisotropic ratio due to passive bolts. As stated in the previous section, due to group action of passive bolts, joint and intact material, this large decrement is observed. 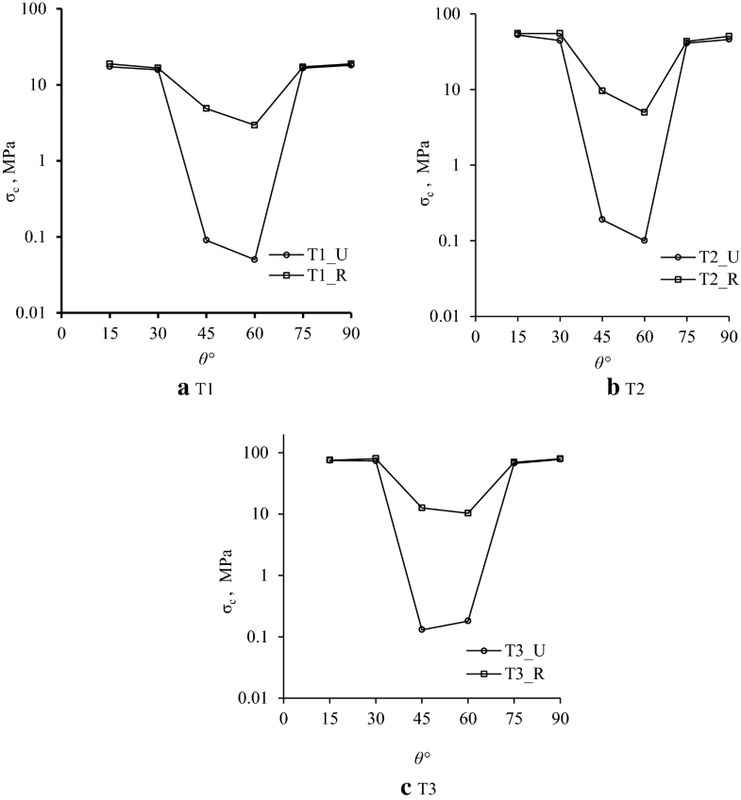 However, no good trend of anisotropic ratio with respect to increase/decrease in strength or modulus is observed. where ΔARσ = per cent reduction in anisotropic ratio for strength; ΔARe = per cent reduction in anisotropic ratio for modulus; (AR)σu = unreinforced rock anisotropic ratio for strength; (AR)σr = reinforced rock anisotropic ratio for strength; (AR)eu = unreinforced rock anisotropic ratio for modulus; and (AR)er = reinforced rock anisotropic ratio for modulus. The per cent reduction in the anisotropic ratio for strength and modulus is presented in Table 4. It is observed that for all the three types of synthetic rocks, there is approximately 98% reduction in the anisotropic ratio for strength due to passive bolts. Reduction in the anisotropic ratio for modulus is found to be approximately 99% for all types of synthetic rocks. In spite of whatever the uniaxial compressive strength or modulus of intact material may be, the per cent reduction in anisotropic ratio is approximately same for all types of rocks (Fig. 6). The per cent reduction in anisotropic ratio for strength and modulus is huge. This indicates that passive bolt-reinforced rock can be considered as semi- or partially isotropic if bolts are treated as integral part of rock. However, this extent of isotropy can depend upon the combined properties of intact material, joint and bolts. An experimental investigation was carried out with synthetic jointed rocks, without and with passive bolts. Uniaxial compression tests were performed on the specimens, and results were analysed. It is observed that the installation of bolts in jointed rocks enhances its strength and modulus values. The enhancement is maximum at orientations θ = 45° and 60°. Bolts restricted the failure through joints and make the rock as a single rigid body. With passive bolts, the anisotropy in strength and modulus is vastly reduced. The combined action of intact material, joint and bolts plays a crucial role to reduce the anisotropy in jointed rocks. Due to group action, the jointed rock reaches partially isotropic or semi-isotropic condition. However, this condition is fully satisfied if bolts are treated as integral part of the rock. The author thanks Prof Mahendra Singh, Department of Civil Engineering, IIT Roorkee, for their valuable suggestions and motivation. 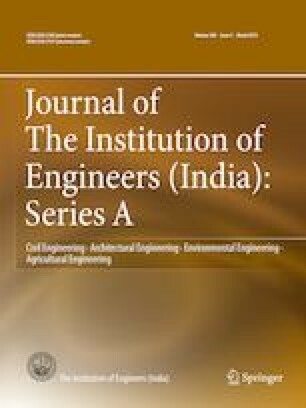 The author also thanks the staffs of Geotechnical Engineering Laboratory, IIT Roorkee, for providing help in the experimental work.